Jennifer Schell has published three internationally award-winning cookbooks in her series, The Butcher, The Baker, The Wine & Cheese Maker. The 1st was published in 2012 (no longer in print), followed by the By The Sea version in 2015. Her current cookbook was released in Spring of 2016 and is an all-new version of the 1st book featuring the food, drink and farm community of the beautiful Okanagan Valley in British Columbia Canada. Jennifer Schell's third cookbook and latest cookbook is a new version of her first book featuring the food, drink and farm community in the Okanagan. 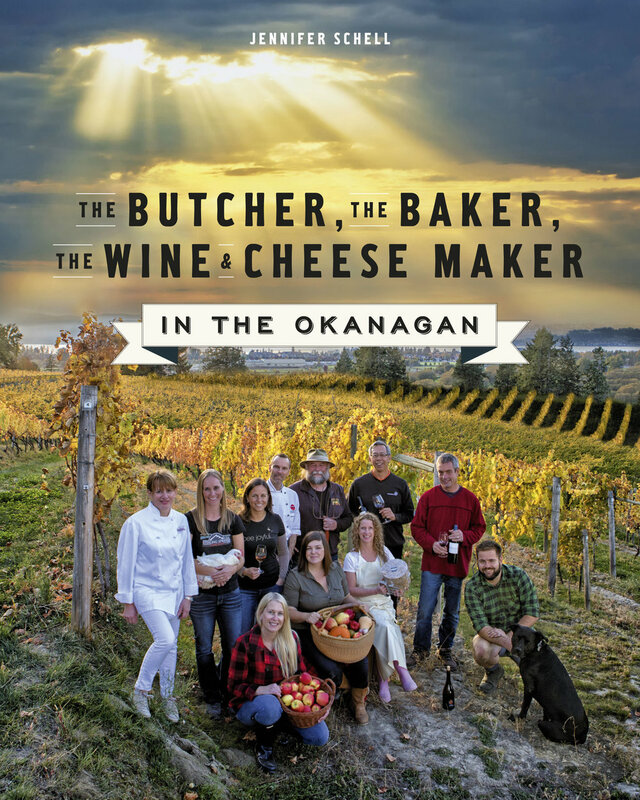 In 2012, Jennifer Schell brought together 160 of the Okanagan Valley's best chefs, wine makers, and food producers to create The Butcher, the Baker, the Wine and Cheese Maker: An Okanagan Cookbook. It was an instant success, selling more than 7000 copies and winning national and global awards. Updated to reflect the constant evolution of food production and culture in the famed valley, this second edition includes profiles of the newest players in the area's culinary scene, new recipes and food and wine pairings, and updated profiles of the region's renowned and respected farmers, producers, artisans and agricultural innovators. In addition to delicious recipes for every meal, such as Quinoa Crusted Falafel Mignon, Sezmu Beef Tartare, Okanagan Lavender Mascarpone Souffle, and Saskatoon Berry Pie, this collection features the stories of the area’s experts, and a listing of the area's foodie festivals and events. Laid out in the same style, the 2nd cookbook was a celebration of the community on BC's beautiful West Coast. A celebration of British Columbia’s coastal cuisine with recipes and fork-lore from the region’s farmers, artisans, fishers, foragers, and chefs. The Butcher, the Baker, the Wine and Cheese Maker by the Sea is a tribute to the remarkable innovators and culinary leaders who make up Canada’s west coast food culture. Discover some of the most diverse and delicious food on the planet—from the fabulous food-truck fare of Tofino to the elegant dishes of downtown Vancouver’s five-star restaurants, along the Sea to Sky highway to the famous après-ski pub grub of Whistler and the hearty, homegrown smorgasbord of the lush farming valley of Pemberton. In addition to delicious recipes, such as Beignet with Baked Bowen Apples, Sea Urchin Bruschetta with Avocado, Pepperoncino and Spot Prawns, and Huckleberry Crème Brûlée, this collection features the stories of more than 150 of the area’s experts. Discover why Vikram Vij is the maharaja of the west coast, how Lisa Ahier put a gourmet spin on traditional Texas taste, what inspired David Hawksworth to create his own foundation for young chefs, and where Donna Plough grows her sought-after BC artichokes. 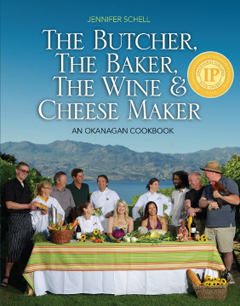 The follow-up to the international award-winning The Butcher, the Baker, the Wine and Cheese Maker: An Okanagan Cookbook, this collection is a commemoration of the intricate community, network, and culture that defines British Columbia’s coastline and the abundance it has to offer. The original cookbook! A true about of love, the initial book was self-published by Schell. Her dream to feature the amazing people in her Okanagan community was realized in 2012.